Our local library has a really neat resource - story time kits. Each kit is centered around a theme and contains books, games, movies, music and other items related to the theme. We had never checked one out before, so we decided to give them a try at our last visit to the library. The kit we checked out was themed "Friendship." Even the tote the kit is packaged in is cute! 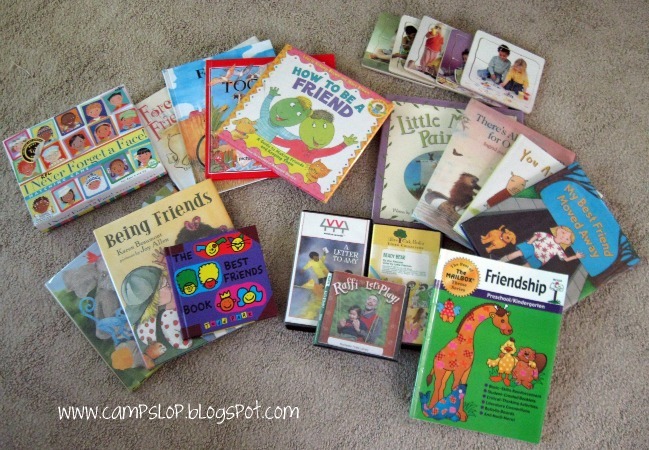 The contents of this kit included 11 books about friendship, 5 puzzles, 2 movies, a music CD, a memory game (I Never Forget a Face), and lesson plan book. 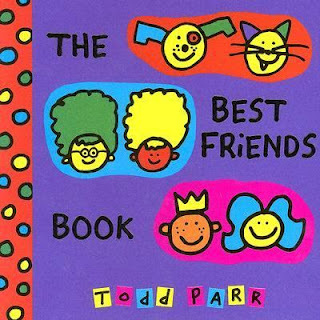 The Best Friends Book was the kids' favorite book. Each page tells what makes a best friend - some silly, some not. "A best friend shares everything - even chicken pox" is one example. 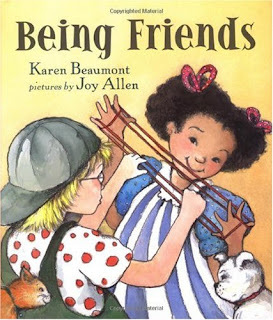 Being Friends is a great book about how friends can like different things but still like being friends. It delivers a great message that it's okay to be yourself, different from others, and still be a good friend. 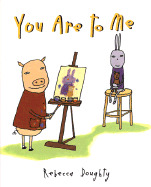 You Are To Me is a cute story of friends telling each other how much they mean to each other. 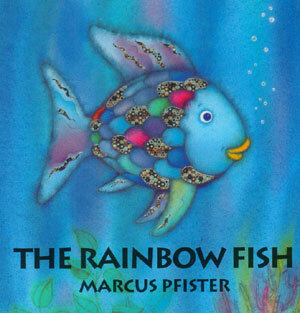 Though not included in the kit, we had to include The Rainbow Fish. It's one of the greatest books on friendship, in my opinion. We decided to paint our own rainbow fish. 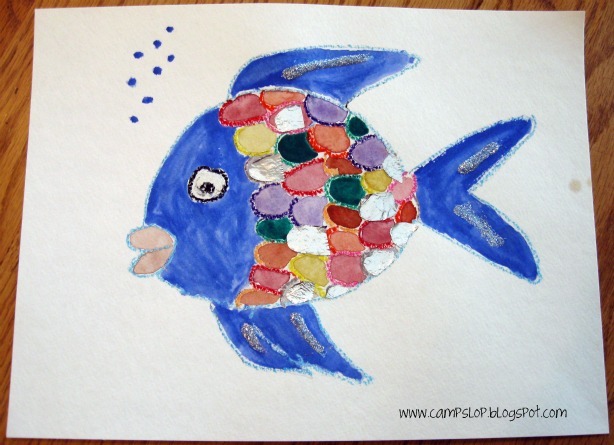 I started by tracing a rainbow fish coloring page (I found one here) on to watercolor paper. 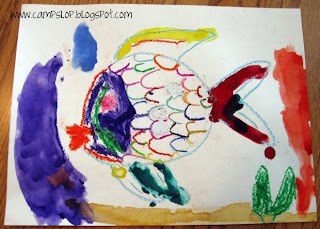 The kids traced over the picture with oil pastels and then painted with watercolors. Once it was dry we added glitter to the fins and glued on tin foil scales. 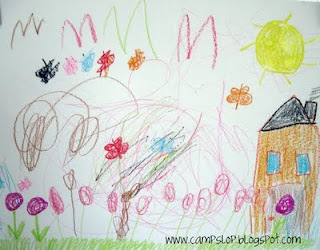 Next, we made a "Friendship Drawing." We started with one sheet of blank paper. I went first and drew one element (the grass). 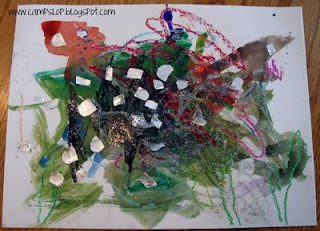 Then I passed the paper to Pinky who added one element. She passed it to Chaos and we continued in this manner until our picture was complete. 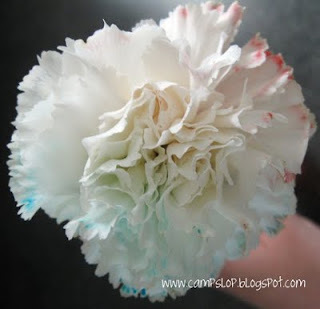 For a twist on the classic carnation and food dye experiment, we tried making "Friendship Flowers." 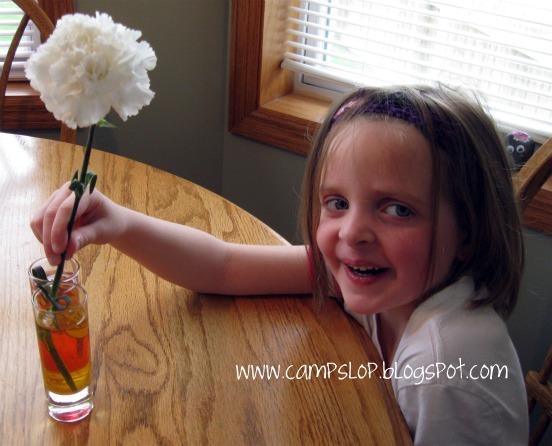 We cut the stem to a white carnation in half (but left both halves in tact to the flower). Each kid picked one color and we dipped them stem halves in them. Pinky with the yellow/red flower before. Chaos with the red/blue flower before. 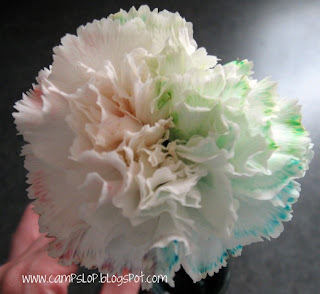 When the dyeing was complete, the flowers had turned 2 different colors. 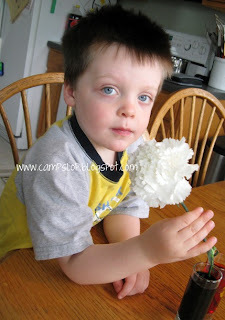 We even tried a tricolored flower (red, blue, and green). 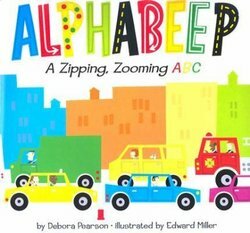 Alphabeep is a stroll through the alphabet with every letter represented by a vehicle (fire truck, garbage truck and the clever zamboni) or street signs (yield, keep left). Alphabet Under Construction is just as the name suggests - an alphabet being built by a little rat. It's from the second book that I came up with the idea to make a "construction C." After cutting out the letter C, Chaos added popsicle sticks (wood), sand paper and "wire" (necklace cord) to build his letter. Both thenes had great books and crafts. I am going to look for the construction books for JDaniel. 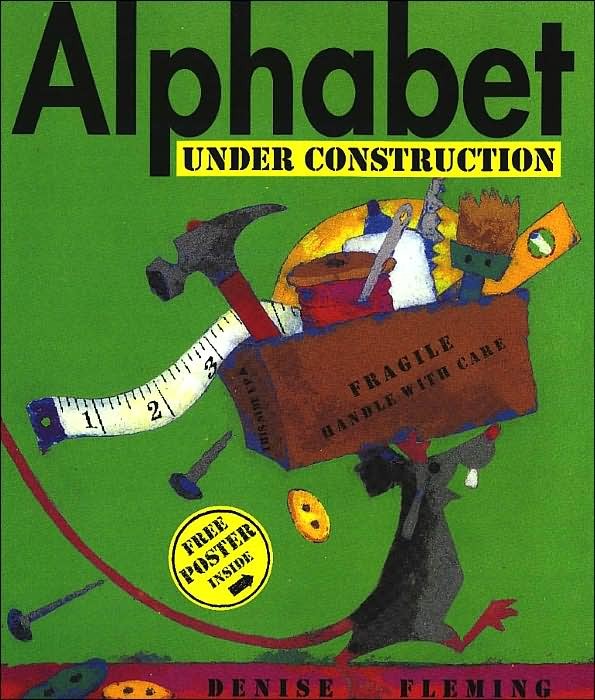 I think the alphabet books you mentioned would be a hit in our house too. Oh my - I never knew you could get a carnation to pick up TWO colours! 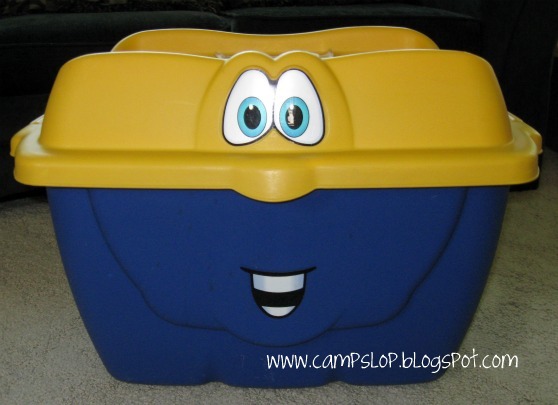 How fun and such a great experiment for kids! 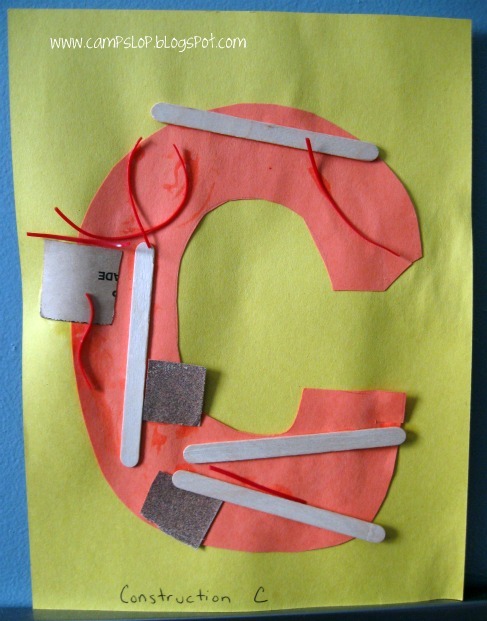 Thank you for stopping by and linking to Kids Get Crafty! I love that carnation experiment. My kids would love doing that. Thanks for sharing at my art party!